To reach Well Complex 7, you must wind along Highway 18 as it rises 5,642 feet above sea level through the San Bernardino National Forest, the green mountains framing the sprawl of the Inland Empire. Near the burg of Rimforest, you park on the shoulder and descend into a narrow canyon along the west fork of Strawberry Creek, where the chaparral blocks out the gusts of wind and noise of the road. Then follow the trail past California myrtle to a concrete-and-stone bunker, cracked from decades of use. Gary Earney, a retired 30-year veteran of the U.S. Forest Service, is leading me and 25 activists on a hike to the complex of four wells, which diverts water from an underground spring 400 feet inside the mountain. From there it travels via four-inch steel pipes down the face of the canyon to a tank four-and-a-half miles away, eventually finding itself in bottles bearing the Arrowhead brand name. It sells for $2 a liter. Since the Swiss food-and-beverage conglomerate Nestlé acquired Arrowhead in 1992, it has paid the forest service just $524 a year for access to the water. A little solar panel provides all the power needed to control the flow; no staff oversees operations. The water rights themselves, which the company says are based on a 19th-century possessory claim, cost nothing. You would think that an operation like this on public land would generate government interest. But despite the ongoing drought, the forest service allowed the permit for the operation to expire in 1988. It has not scientifically evaluated the effects of groundwater extraction on wildlife and the environment since then, letting Nestlé continue to pump as long as it pays the tiny access fee. The arrangement caught the public’s attention only last year, owing to a series of articles in a small Palm Springs-area newspaper called The Desert Sun, but the reaction was swift, with activists picketing and filing a lawsuit. The outcome of the suit may determine the fate of the natural spring water business throughout the state. Entrepreneurs have harvested water from underground springs in Southern California since the earliest settlements; missionaries tapped springs in the Arroyo Seco to operate mills and tanneries. Before 1914, Californians could claim rights to the water simply by posting a notice and constructing facilities to withdraw it. In the early 20th century the Elysian Spring Water Co. maintained an operation near the future site of Dodger Stadium. Sparkletts still has a bottling plant in Eagle Rock, where it once relied on a spring. There are 108 bottled water plants statewide, according to the California Department of Public Health. Arrowhead began bottling water in 1909, and the brand has been tapping Strawberry Creek since the 1920s. At their peak Arrowhead wells drew as much as 170 million gallons annually from Strawberry Creek, compared with last year’s 36 million. 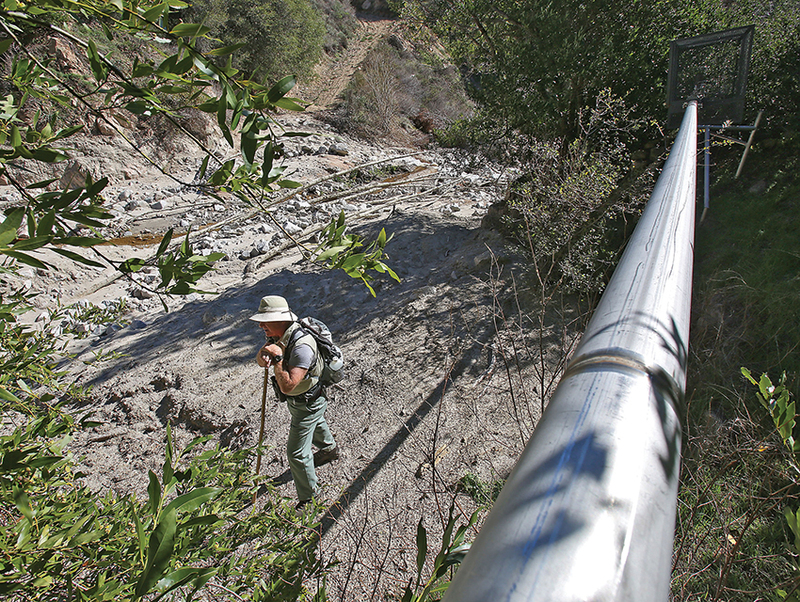 The U.S. Geological Survey plots the normal stream flow discharge for the creek based on 94 years of data. The median level in June is anywhere between 1.7 and 2.3 cubic feet per second. With rains from El Niño barely reaching Southern California this year, no day in June saw stream flows above 1.2, and most have been closer to 0.67. Last year “held the record low flows for many dates, and there is a good chance we will be seeing the lowest on record very soon,” says former forest service wildlife biologist Steve Loe. Like Earney, he’s a well-publicized critic of Nestlé’s presence. National forests are not national parks. The forest service has an explicit mandate to facilitate multiple uses of the land it manages. Springwater is only part of the picture; oil extraction, ski resorts, and mining and timber operations can be found on forest service property, too. But the federal agency is supposed to balance commerce with habitat maintenance and conservation, ensuring that the resources removed are only in excess of the needs of the forest. Nestlé declined to provide a spokesperson for this article, but on its Web site the company claims to take “water management very seriously” and “consistently monitor our spring sources for long term sustainability.” The company used similar arguments when attempting to set up a water-bottling plant in Hood River County, Oregon; however, residents voted overwhelmingly to block the project. Monroe County, Pennsylvania, also recently blocked a proposed water-extraction facility. And the backlash from The Desert Sun’s reporting has activists targeting Strawberry Creek. to do business in the state. Moreover, the initial possessory claim from 1865 didn’t include Strawberry Creek, according to Amanda Frye, a local activist who spent months combing land grant archives to verify Nestlé’s claims. In the process she found a newspaper clipping from 1886 declaring, in her words, that “the original pipeline and water rights were for Coldwater Canyon,” which adjoins Strawberry Creek. The Secretary of State’s office has suggested that corporate subsidiaries don’t necessarily have to be registered in California, but the State Water Resources Control Board is investigating the issue. The plans don’t specify whether the environmental assessment would entail a comprehensive look at the hydrology or a more minimal review. So the Story of Stuff and its partners argued for the comprehensive option in a district court hearing on June 13. There’s also apprehension that because Nestlé will have to fund the research, it would be able to select the researchers. And during the review, Nestlé can continue to divert water, making it impossible to set a baseline for stream flow. “The watershed is extremely stressed and needs to recover,” Loe tells me. “Continued removal of massive amounts of water will never allow for recovery.” He and Earney still give occasional tours of the wells. In April, a few months after my Well Complex 7 excursion, I attended an open house at forest service headquarters in San Bernardino, where residents could question the staff and deliver formal comments. Skepticism was the dominant mood. Two burly men grilled environmental coordinator Tasha Hernandez. “What interest is there to the public to taking the water out of the mountain?” one queried. The other asked about fees. Hernandez explained that they were determined at the federal level by the acreage used. I pointed out that the total fee was $524 a year. “That’s it?” one of the guys exclaimed. “What concerns me,” another resident said to forest service hydrologist Robert Taylor, “is you study this for 20 years and you find out there was more water. Meanwhile Nestlé got water for 20 years!” Taylor replied, “I’d appreciate it if you put that down as a comment and provide it to us.” The comment period ended in May, with more than 38,000 comments logged, most of them from residents seeking to end Nestlé’s operation. It could take a year or more before a final decision is made.